We’re excited to announce the launch of TrueUSD, a USD-backed stable cryptocurrency. TrueUSD offers token-holders full collateral, regular auditing, and legal protections to redeem TrueUSD for USD. Early access is available today for institutional accounts, hedge funds, traders, and exchanges. We believe TrueUSD will provide a long-awaited stable trading instrument for cryptocurrency traders, and enables consumers and businesses to use a cryptocurrency as a medium of exchange. The price volatility of cryptocurrencies prevents their widespread adoption. In the mainstream economy, most businesses still find it impractical to use digital currencies. In the decentralized economy, many decentralized applications will be difficult or impossible without a basic medium-of-exchange token. Tether is currently the largest fiat-collateralized cryptocurrency. 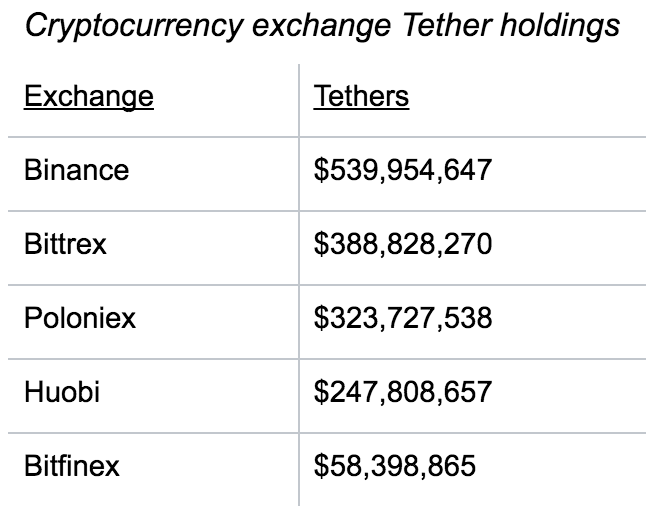 At the time of writing, there are over $1.63 billion of Tether in circulation, but there are no up-to-date audits to verify that those funds are available for redemption. Additionally, Tether holders have no legal guarantee that Tethers can be redeemed for traditional currency. Protocols, decentralized apps and exchanges relying on the current solution are at risk. Ultimately, token holders need currency backing that they can trust. We wanted to build a stablecoin that we would use and trust ourselves. TrueCoin is a service that issues tokenized currencies and assets; TrueUSD is its first stablecoin token. TrueCoin partners with registered trust companies and banks to securely hold the funds backing TrueUSD tokens. For increased security, the trust companies handle all funds directly. The TrueUSD system does not handle or have access to the escrowed funds. When you wire funds and complete the KYC/AML process, you become a beneficial owner in the escrow account to which you have sent funds. Your ownership in the account is legally recognized and each TrueUSD token you receive is akin to a redeemable certificate of ownership for $1 from the escrow account. As one of the most widely used legal vehicles for fund management, escrow accounts enable regular auditing and strong legal protections for coin holders . See the FAQ for more details. Our legal framework enables you to exchange USD directly with an escrow account — we never touch the funds. Instead, we connect you with one of the escrow accounts in our network of fiduciary and banking partners to purchase or redeem TrueUSD. This reduces the counterparty risk that is common in other collateralized stablecoin projects. Every TrueUSD is always fully collateralized by USD, held in professional trust company’s escrow accounts. Our publicly audited smart contracts mint TrueUSD when USD clears the escrow accounts and burns TrueUSD when USD is redeemed to ensure a 1:1 parity between the TrueUSD in circulation and USD in the escrow accounts. The bank account holdings are published regularly and subject to ongoing professional audits. We regularly undergo independent third-party evaluations by leading auditors, to ensure best security practices. We’re starting with USD, and we can extend this model to other fiat currencies like Euro and Yen, precious metals like gold and diamonds, and even baskets of assets like stocks and real estate. How will TrueUSD maintain price stability? Price deviations between TrueUSD and USD present an opportunity for arbitrageurs. Since traders can always trade TrueUSD for the equivalent USD on TrueUSD.com, there will be an incentive to buy or sell mispriced TrueUSD on exchanges and convert on TrueUSD.com. Someday, governments may allow for direct legal representation by digital entities, eliminating the need for a human intermediary to open a bank account. Until then, we can take a practical hybrid approach by interfacing with escrow accounts, a part of modern legal infrastructure that already offer solid legal representation. See the FAQ for more. In practice, we will start with a small minimum withdrawal amount to prevent the early network from being overloaded. See the Fees page for details. TrueUSD opens the door for mainstream commerce to use digital currencies, and for blockchain-based applications to trade and transact with confidence. Mainstream Commerce: Normal people and businesses can enjoy the benefits of digital currencies (faster transaction speed than ACH, global reach) without the volatility of Bitcoin. Now you can pay salary, take out a loan, or buy coffee with a cryptocurrency, enabling a new economy of cryptocurrency financial applications. Long-term Financial Contracts: Stable cryptocurrencies enable smart contracts that are enforceable over time, such as prediction markets, salaries, and loans. Developing economies: Some developing markets are increasingly reliant on cryptocurrencies for trade. Financial institutions: An asset they trust (USD), in a legal vehicle they’re familiar with (escrow accounts), to make trades in the crypto markets. We’re doing this in response to huge demand for a trustworthy stablecoin from the crypto community. TrueUSD uses our TrustToken platform to offer token-holders legal protection and regular auditing. We believe that creating a trustworthy, USD-backed stablecoin (by tokenizing US Dollars) is a powerful application of our platform, and addresses an important problem for the crypto community. We’re always happy to talk with traders, exchanges, and advisors who are interested in collaborating. Please email partner@trusttoken. If you or someone you now would enjoy a key role at a fast-growing startup with high standards for authenticity and value creation, please apply here. ✓ Complete the SmartTrust, start developing TrustProtocol for auditing and insurance. ✓ Establish partnerships with banks and exchanges, continue to develop TrustProtocol, and do a pre-sale fundraising round for the TrustToken Platform on which TrueUSD is built. ✓ Support wire transfer purchases/redemptions. ✓ Deploy TrueUSD smart contract, begin capitalization of the TrueUSD accounts. ✓ Launch the alpha version of TrueUSD for traders and organizations. ○ List TrueUSD on exchanges. ○ Launch the beta and 1.0 versions of TrueUSD for general access. ○ Develop more stablecoin products such as TrueEuro, TrueGold, and baskets of tokenized commodities, to provide more trustworthy options for cryptocurrencies backed by real-world assets.